SORRY I DO NOT SHIP THESE OUT OF THE UNITED STATES. SHIPPING:Someone Will Have To Sign For It When Delivered. 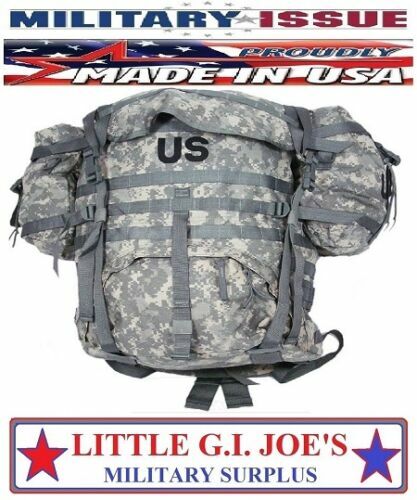 This is the Army Issue MOLLE II Ruck Sack Or Backpack, Current Issue by the US Military. MOLLE II Modular Lightweight Load Carrying Equipment Large Rucksack. Gen 4 frame, Two (2) Sustainment side pouches, adjustable padded shoulder straps and waist belt. Rucksack has approx. 5000 cubic inch capacity, load weight up to 200 LB, Frame measures approx. 23" x 15". U.S.G.I. Military Issue Army MOLLE II SDS Large ACU Camo Rucksack Complete.